Remember: A watched pot never boils. 1. The choir starts to preach. Teacher-leaders rise up and begin to take over planning, facilitating, and analyzing professional development. Whether this takes place in professional learning committees, whole-staff meetings or small teams, encourage their leadership and align with their visions. 2. One-on-one chats spark school-wide conversations. Have you ever heard of the term “micropolitics”? It is when you seek to achieve a goal through one-on-one conversations. You can use intimate chats like these to build trust and listen. You can also lean on micropolitics to float an idea to staff and get their feedback before introducing a larger change. Watch as the staff involved in these small conversations become stakeholders and cheerleaders for change. Teachers’ unions focus on protecting the rights of their union body, as they should. However, when a union is so focused on reacting to fires instead of working toward transformation, it can create a very us-versus-them approach. Work hand in hand with the union to predict and prevent issues and concerns. You’ll know change is happening when members of the teachers’ union begin to say “we” in regard to the administration and teaching staff. You’ll know change is happening when members of the teachers’ union begin to say ‘we’ in regard to the administration and teaching staff. 4. Teachers hold each other accountable. 5. Veteran staff support new staff. The first few years working in a school or teaching a new subject or grade level can be incredibly difficult. This problem is even more compounded in Title I schools, where there are opportunity gaps. Once teachers get over the hump of being new and become established within their school, it’s easy for them to mind themselves and settle into their routines. Keep an eye out for those veterans who step out of their comfort zone to identify new or struggling teachers and offer support. Encourage their generosity of thought and experience. This staff collaboration is proof that change is happening in your school. 6. There is a drive to dig deep. When your staff holds up a metaphorical giant stop sign to protect an initiative you’ve established, pat yourself on the back. Instead of feeding the urge to start from scratch with a new process, appreciate the fact that they have latched on to change you’ve already created. Take the time to work with your staff and examine what works and what needs revising. 7. Sparks of enthusiasm pop up in unexpected places. Teachers are not the only staff members capable of inciting change. Change also looks like security guards requesting weekly meetings to align priorities, teaching aides using the project-based-learning language you introduced in a staff meeting, or secretaries talking about your school’s vision to prospective parents. 8. Focus shifts from behavior to instruction. There’s a common belief that children cannot be taught unless they’re well behaved. This leads to many educators investing time and resources into classroom management, school policies, and consequences. Due to implicit bias, this is especially true—and can be really tricky—when working with low-income students of color. When staff shift from conversations about behavior to conversations about engaging students and providing support, you know change is happening. When staff shift from conversations about behavior to conversations about engaging students and providing support, you know change is happening. Repeat after me: You cannot do all of this alone. You need new leaders, and you are probably working to cultivate them. Scoop up those staff members who express interest or demonstrate a passion for leading new initiatives. This can look like a teaching aide wanting to form phonics committees, a teacher spearheading a trip to a math conference, or a PTA parent stepping forward to coordinate a teacher-appreciation event. When you are looking for signs of change, you often look at the big data, like test scores, graduation rates, or a significant decrease in suspensions. 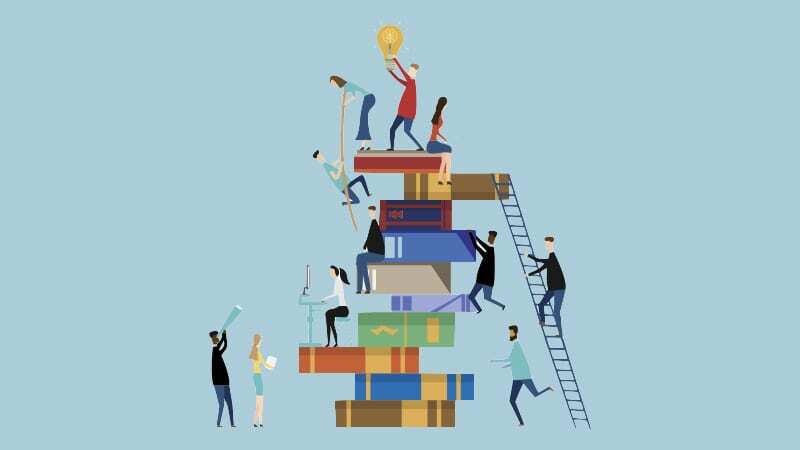 However, you might hear rumblings or people saying things like, “It just feels different,” “It feels like students are actually learning,” or “It seems like staff want to be here.” These are crucial qualitative signs of change that don’t always get recorded on your school’s accountability report card. 11. Staff take fewer sick days. When I first started, I was blown away by how many people were out each day. And don’t even get me started on Fridays or the day before or after a long weekend. It was a mad scramble each morning, and I was often subbing classes and stressing out. However, when you come in and check the sub board and it says No Vacancy, it’s a sure sign of improvement. This means people want to be there, prioritize consistency for their students, and don’t want to leave their team hanging. 12. Teachers cover for each other. Sick days are inevitable, and ensuring coverage can be painful. When teachers notice these gaps and ask, “How can I help?” or say, “I can take Ms. X’s second period,” you know the culture is getting stronger. The times when principals get acknowledged for their hard work or for accomplished goals are far and few between, especially since they’re the ones pushing change and challenging the status quo. When you get praise for your hard work, dedication, or inclusive leadership, that means something. This might happen during a staff meeting, on social media, or make its way through the grapevine. Cherish these moments. You have plenty of official groups, such as leadership teams, grade-level teams, and subject-area departments. But when groups come together on their own, it is a sign that the culture is shifting. These teams might not even have a name or be paid! They form to address a need or pursue a common passion. All you need to do is water the grass and let it grow. Find a way to highlight their work and share it with others. 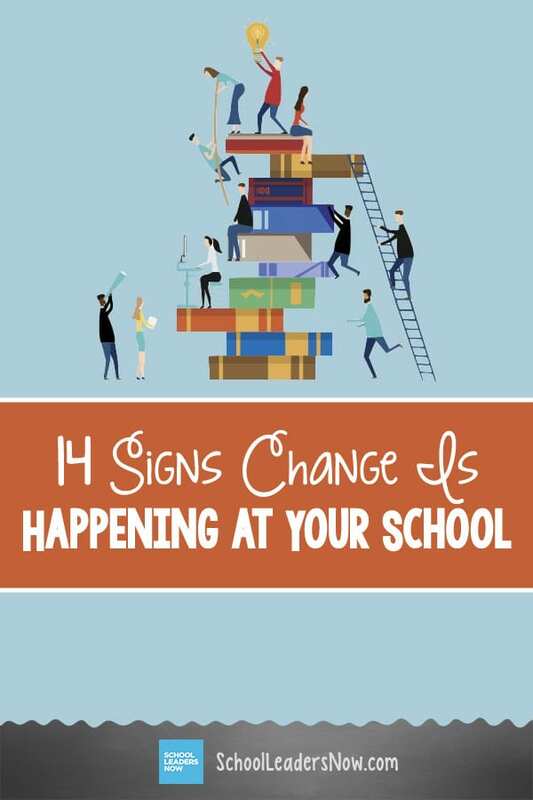 What are the signs you look for to signify change taking place at your school? Share them with us in our Principal Life Facebook Group. Plus, does your school have a mission statement? It should.